Mix the banana, cucumber and noodles and add the salad cream, salt and pepper. Keep the carrots and the lettuce leaves in cold water for 10 minutes. Fill the salad bowl with the chilled salad. Decorate with carrots and lettuce, sprinkle walnuts on top and serve. All vegetables of your choices…like Broccoli, Onion, Cauliflower, Carrot etc. Steam all vegetables, but they should be crisp. so don’t steam it too much…Afterwards Rinse these vegetables under cold water. Take them in a large bowl. In another bowl mix all ing. 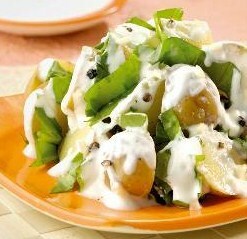 for dressing and mix well throughly and pour into vegetable bowl.Chilled it in fridge. 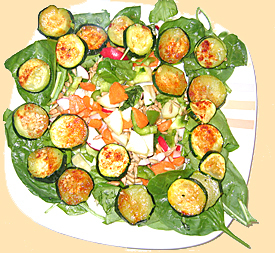 Your Chilled & steamed Vegetable Salad is ready.